Oh what momentum, a second table finished in a five day period, this is a boonful harbinger, yes boonful I say, for the coming year. 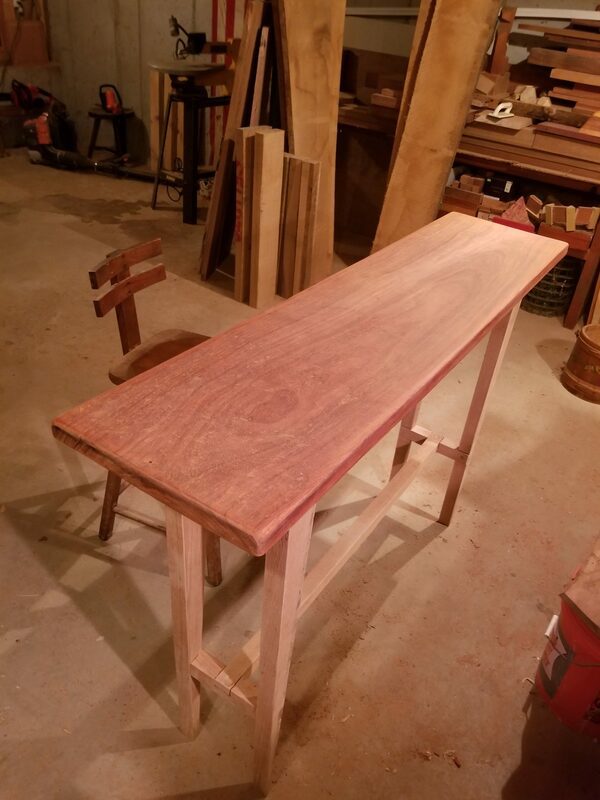 The top is of Padauk, (wood database, wiki), just a gorgeous wood both to look upon and with which to work. The legs and bracing are cut from a single piece of black oak, which of course is in the red oak family. There are many non-fatal flaws of imprecision in this piece. The lower twixt legs cross beams are doweled to the legs (no error there) and likewise there are high twixt leg crossbeams, intending to be flush to the table bottom but in one case not succeeding. The tops of the legs are rectangular and divided into two squares, one (one the side of the leg perpendicular to the table bottom) protruding half an inch higher than the other. A corresponding shallow blind mortise is notched into the table bottom. During assembly the table fop was set upside down and said cavities were filled with T-88 structural epoxy. 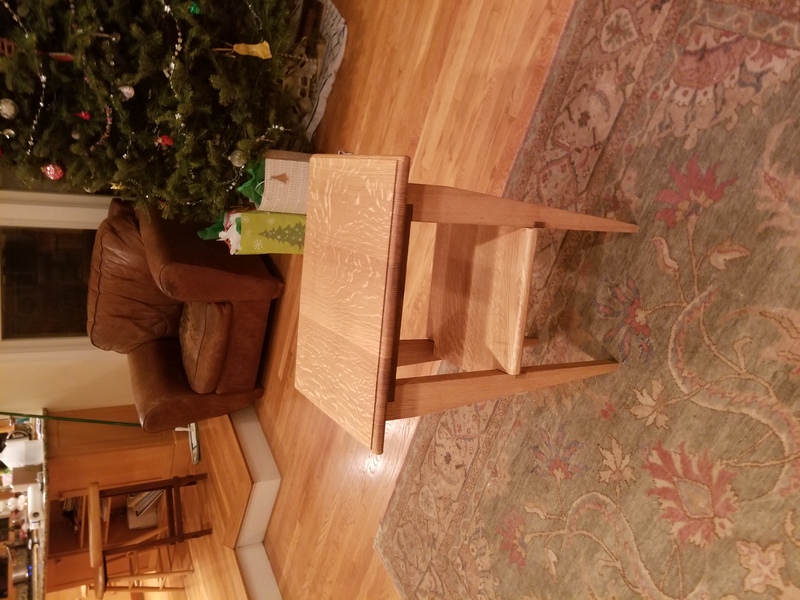 The legs were set into these, the high cross beams doweled at angle into the table top, and the overhanging second (square) portions of the rectangle (meant to be but not always flush to the tabletop) also doweled at angle into the tabletop. Those joints should be of more than sufficient strength. 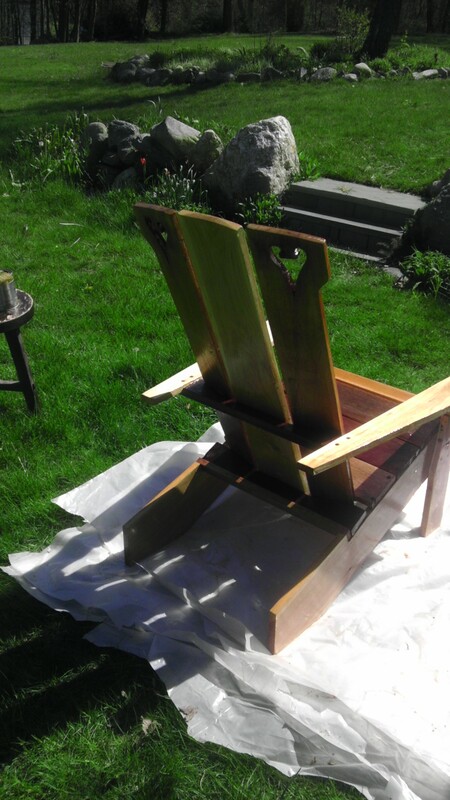 The legs and superstructure where sanded to 80 grit with all corners softened. The tabletop to 220 grit. 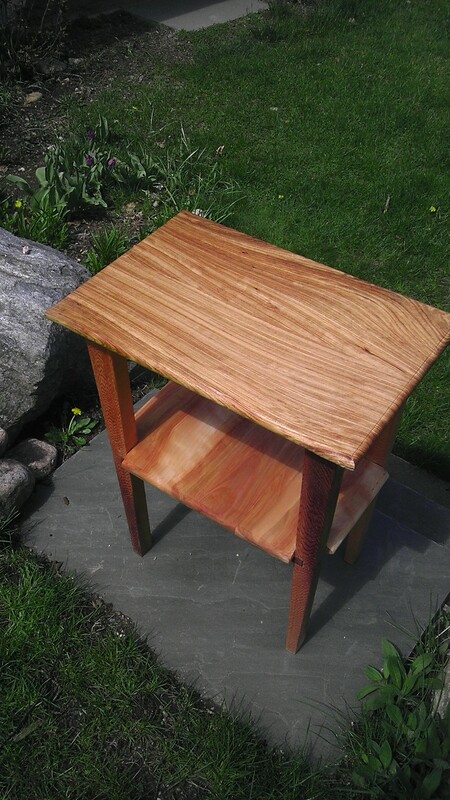 Tung oil and limonene will finish all surfaces… food safe! As an aside, this is my knee-jerk go to finish. If anyone wants fancier, please, at your leisure proceed. In that second photo note the chair at bottom right and the red vise top right of center. Both formerly of my great grandfather, Walter, born 1885 and passed in 1974. I remember visiting the last house he lived in and finding a wooden model of an airplane in his attic. It occurred to me today that he would have been well a grown man before airplanes entered the mass consciousness. Greetings to you all, the imagined motley horde that delights in all this narrative of experience, the pain, the beauty, the wisdom, the delicious nuance and plaintive sharing. Today I have good news, though it will be broken into two segments, one per table, for today I have completed the second of two tables, tables that were for far too long in neglectful and partial states of completion. This is a white oak (quartersawn) end table, suitable for a lamp and a book adjacent to an armchair or a couch. The only noteworthy error is that the plane describe by the shelf is not perfectly parallel to the plane described by the surface of the table. It is a small divergence, but yet a small divergence projected over a sufficient distance will certainly be observed – for example, the astronauts who calculate that they missed the moon by only 0.0000131 of a degree, which unfortunately translates into 1147 miles and a cold trip to eternity. Thankfully no lives here depend on sufficient correctness. I just would seem conscienceless not to report the discrepancy. I consulted with two domestic authorities who assured me that the error did not matter. It’s funny how, in nature, that we see circumstances where like things clump – certain sizes pebbles, types of shells, leaves and seeds, etc. No doubt it’s because the processes that sweep through the reality, currents of wind and water and time even itself grab each thing by what it affords to be held and change the position and character according to their influence – or something like that – but do take note, if you haven’t, of this. So, stairs. I’ve not given any thought to stairs per se much ever, yet this summer and fall no less than three sets of outside stairs required some sort of detailed review and partial rebuild. Really, dear reader, you may skip entirely the tiresome monologue which is to follow, nonetheless it is one of the sorts of things I document, for insight hides in small things and perhaps virtue in the infinitesimal, (or maybe the reverse, but I know both are scarce and elusive). I’m sure that little attracts your eye in the picture above. It seems, though, the facts are, that perpendicular to the direction of the step treads, on the top layer underneath the planks, run lines of nails as if the planks were nailed to joists beneath them, those presumed joists presumably perpendicular to the planks. Oh human folly and frailty! Now to take off the planks to examine the underlying reality requires that some accommodation be made for the ‘decorative’ column on the left. I call it decorative because it cannot be seriously structural – no structural element worth its weight would be deployed on top of decking, but I’ll save that monologue for another time. You’re welcome. One could take off the planks not beneath the column, put a temporary column behind the present column, remove the present column, remove the planks and lo, at what little effort have revealed what lies beneath. Or one could say ‘Foo’ – the just saying of it is very powerful – and cut through the three planks that underlie the column, just next to the right side of the column, and even say ‘Ha!’, for then the revealing of all that lies beneath is a much simpler task, not that one has not introduced some issues in the reconstruction, but certainly fewer than the whole column swap exercise. This later path – Foo. Ha! – is the one I took. I realize I have not said why yet. Facts are that it was reported, and could be verified empirically, that along the rightmost line of nails on decking, those going into the presumably perpendicular joists, that a great softness was to be experienced, as if the presumed joists were rotting. There was sag in the planks there, and, as the problem was noted but neglected for a year or so there came to be identified a similar softness and sag along the second line of nails at the front three planks (not counting the edge plank). Presumably more rot, now in the second presumed joist. Men must follow their conclusions, this perhaps being the hardest of lessons, and any foo ha notwithstanding, with azebiki in hand (there is no azebiki wiki, unfortunately, or I’d link you there) (an azebiki is a type of Japanese hand saw where the blade is curved convexly and so can cut into a flat surface, really a great tool) I cut the planks adjacent to the column. I removed the edge planks and the first three boards. I found two unexpected conditions. First, as you’ve probably intuited, the joists did not run perpendicular to the planks at all – that would be just too simple. They ran parallel and then between them were inserted and nailed spanning sections of 2 x 8, <joist emulators! ?> into which the planks were nailed. There was no rot in the joist emulators, rather that two of them were barely affixed to the true joists and over time had become loose enough as to no longer provide the support expected of their role in service. Failed joist emulators. Bad joist emulators. Woe unto the improper affixer of a joist emulator, may your perdition match your indolence – woe I say. But really this turn of events was bright and rather than having to replace the whole presumed rotten joist now it was merely a task of properly affixing the failed joist emulation sections. Frabjous. But wait, a second condition was revealed in the frame of the platform. The outer box of the rectangle supporting the deck was made of 2 x 10’s, doubled, faced by a white 1 x 10. Just taking the edge planks off revealed a considerable nest of carpenter ants, mostly in the outer 2 x 10 of the left side, a little on the left side of the front 2 x 10, in each case behind the white facing board. No so frabjous. 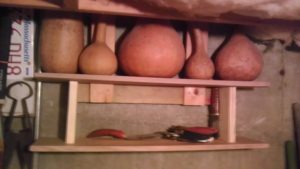 Therefore some careful removal of rotted/infested material followed, the usual insults to reason and rightness subtly interwoven, and then a very sound reconstruction featuring the addition of an additional joist emulator, fittingly underneath the line that first my abeniki had taken. 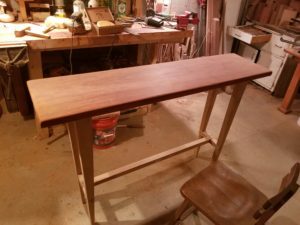 With grace I made additional mahogany sawdust and mixed it with epoxy resin so that when I got the planks back on I could putty the sawn gaps in a manner both strong and matching. Then finally I re-stained the deck. I try to regard the whole exercise as a joy. Such a tale. More steps, you ask? Yes. I asked the same question. It was during the time that the aforementioned steps were cordoned off so that the stain could dry. It was during that time that it was discovered that no less than all three of the bluestone flagstones were significantly loose, so loose indeed that they would tip and might even injuriously (spell-checker wants ‘ingloriously’ and that would be true as well) bite one in the back of an ankle – a very undesirable prospect. Actions to repair followed the next day. Those actions were very pragmatic. The most right thing to do would probably have been to take each flag stone off, chisel out all the ‘thinset’ mortar between the field stone risers and their former treads, mix up new thinset, apply, and properly re-set each of the treads. However, to sweep the existing thinset, to examine it and find that it was barely degraded at all, to identify that masonry adhesive might well do the trick at least for the winter if not for years … Foo. Ha! The job was done very directly, less than an hour of total work, and in the morning no amount of my most manful lifting would dislodge the treads from their rightful places. This last set of steps, I know, the narrative is quite a bit to bear, has a long history, as does the cause for their repair this summer. Briefly I had built these in the spring of 2006 from a few slabs and a few bricks, nothing special, not even cement. This spring I noticed an unusual amount of ant activity on them, even some swarming, as if a great big nest were being built underneath. Indeed, and in my kitchen above for the first time ever in fifteen years there were scavenging ants lugging breadcrumbs and whatsoever back to their not so traceable homes. I put two and two together. I mixed a good measure of boric acid with a few cups of sugar in a gallon of water. My daughter and I removed the first slab – what a trove of eggs and scurrying colony members (picture to follow). We were merciful. We had a wheel barrow. We shoveled out the earth into the barrow, repeated for the next two slabs. We took the ant earth back to edge of the land and dumped it. Got fresh earth, and as we put each layer in laced it with our antagonistic liquid. A clear message to ants thinking of living there again, stragglers trying to return home, etc, but a problem solved without resorting to genocide. We are so talking ‘Foo Ha!’. So stairs, surprisingly, have taken more cycles this season than ever I would have imagined. Is there a unity in these experiences that transcends the unity in the one having the experience? And there’s a little more, that thing you see on top of the steps, the orange head that looks like it belonged to a Cyclops before he was struck by a thunderbolt and a big part split off. That story will follow shortly enough, for I think that stone has asked to become a bird. which is a lot to say, kind of. This box is the eighteenth. 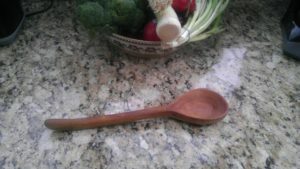 It is made of Live Oak, a wood that I have never worked with. 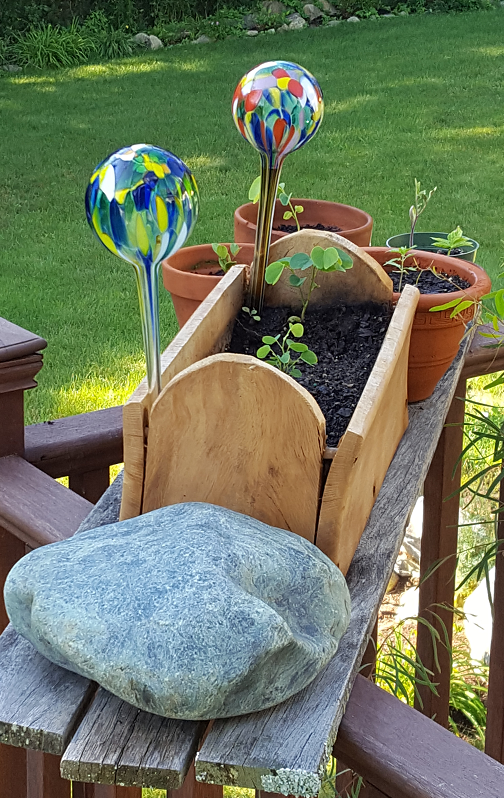 Like Box 6, it is a tombstone planter, which is to say that two ends of it are shaped like tombstones, and not that one plants tombstones there. 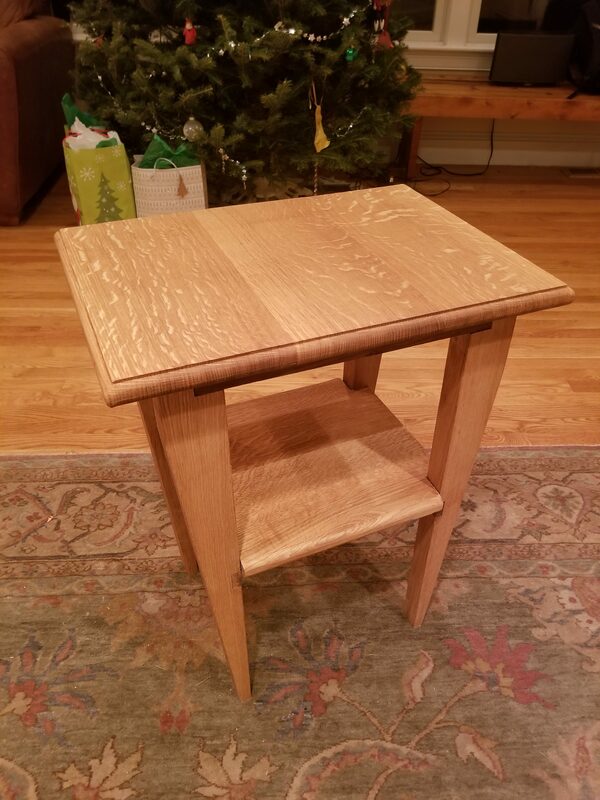 Unlike Box 6, which was of a scraggly Oklahoma white oak and held together with metal screws, this one has no metal, is held together by dowels and glue. You see the trouble, of course. The rectangular walls were flatly affixed to the tombstone walls. Dirt was added. Was the dirt causative of the warping, or the dirt in combination with the subsequent watering? A simple theory is that the wetness on the inside caused that side to expand and thus the warping. I was surprised at the strength of the process, though, that it broke the glue bonds on the dowels. If I should ever perpetrate this design again I’d be inclined to put more dowels in, and at angles, to see how much power the warping has relative to a fastening method designed to prevent it. The box is quite heavy, as live oak is just heavy, as compared to conventional oaks. The janka hardness is 2680, nearly twice that of white oak (1360). Supposedly America owes its successful birth partly to live oak, of which the USS Constitution was made and off which canon balls bounce. That’s a game changer. 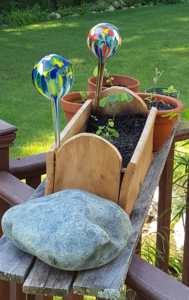 Assuming this planter does not tear itself apart with these powerful stresses, and that some unforeseen bug nemesis does not appear, it could be that these design mistakes will stand illustratively for a considerable time. It was a nice wood to work with. A lot of curves in the grain but a very nice smell, a reassuring strength and density, all bringing a sense that one must be doing something serious. 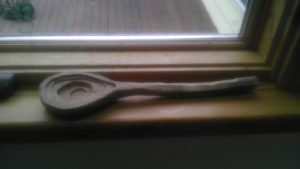 Cumaru was the driver here, that I’d never worked with it (as true of most woods) and that, having designs to make a few other things with it, to make a spoon would be a good way to learn how it responds to tools. I cut the shape with a jigsaw and a Ryoba. The bowl I did as a tiered excavation with a router, later to be smoothed with a few different bits via Dremel. Sanded to 220, standard finish of tung oil cut 50/50 with limonene. 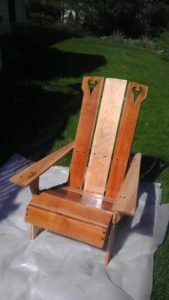 The wood was delightful to work, heavy, holds detail, beautiful smell. Little things accrue (of course they disappear too), little things we mean to do. Here gathered as some sort of existential exhibit are four, all sharing a wood and glue theme. Fix #1 – A Vase of Wormy Pine had a broken rim. A small break really. The good part of this repair was that I was able to find a similar softwood and pretty much closely match both color and grain direction. The less than good part was that all the curve fitting, to get the inserted triangle to match the fluting curls top and bottom, had obvious failings. Overall a useful lesson in how easy it is to fail at something with no conceptual challenge. The execution was more demanding than I had patience for, and the benefit of approaching perfection (other than aesthetic) not high at all. This concerns the original war spoon, the progenitor, a spoon that sits on my desk and doubles very nicely as my back-scratcher, and as such the availability of the beak is a functional requirement. Sometimes the war spoon falls off the desk and twice now his beak has broken off. This happens right where the beak joins the spoon head and it is made the more likely by the grain being perpendicular to the direction of the beak. Reconstructive surgery! And then inserted a fitting piece of mahogany (the same wood as the spoon) into the trench, in this case with the grain perpendicular to the direction of the beak. Instead of the wood glue that I had used in the previous ‘stick it back on’ repair I used epoxy-resin, and mixed up a batch that I laced with sawdust from the mahogany. This would give the right color to any hardened glue exposed in the final joint. Came out great – remind me I have to return here to get a picture of the result. 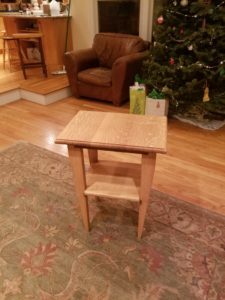 Fix #3 – Kitchen stool had a broken stretcher. More like obliterated. All that remained was about fifteen percent of the original, not at all re-usable. The wood seemed to be a maple with some sort of half-washy finish. By that I mean a little milkiness, but some grain visible. I had no maple lying around, nor any half-washy finishes, but I did have a piece of red oak that upon which I had been testing a draw knife. I decided that to use a draw knife to fashion anything that would experience utility was a rare notch for a modern belt. Thing was, it’s such an intuitive and satisfying tool to use. Took no time. Easy to zoom right to target, with opportunity for subtle and creative nuance. This had been fixed before, but before I knew anything of glue. 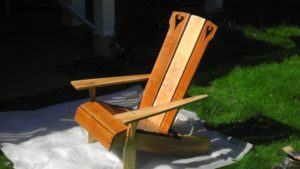 I think I used something soft and rubbery – not really very much adhesiveness – and as you might expect, it did not hold under the stresses a chair would naturally experience. This was therefore a straightforward fix. Use a glue with high adhesiveness and great strength. Epoxy-resin. This is the same stuff I used for the beak repair. Notice the dried and darker smudge on the left. That is where I mixed the beak batch with the sawdust. Now it sits drying. I expect it should be stronger than new by tomorrow. If not I will report. Please have a happy and effective day. Alright dear readers. I know how you’ve been fretting about the incompleteness of certain tasks – tasks begun in all great earnestness but seeming to fade without grandeur … into the woodwork!? Here we have a tale of such a task now nobly redeemed, having arrived at completion, freeing psychological energy and brightening attitudinal space. 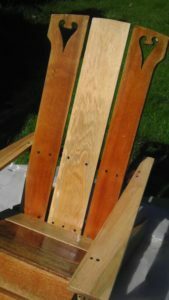 It’s a chair, basically, the first glimpse of which you got almost three years ago here. It began with finding some wood at the dump, three six foot long one by eights. At the time I thought they were oak but in the intervening years I’ve learned a lot about wood and I know that they’re not oak, thought what they are I do not know. Hard though, almost a color like poplar, but surely harder, just not sure. Let me know if you have an intuition. Also I had found at the dump an oaken (this was oak, not sure if red or brown, but not white) tall cabinet. I took the front off it. Some nice pieces there. 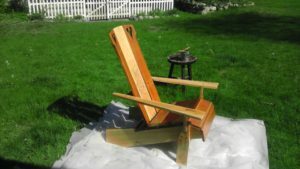 Basically this chair is green, the way folks like to use the word in these days of sustainability, and up-cycled. Those adjectives certainly adhere – we’ll keep building on that. The ideas then, not that I don’t reject Platonic idealism, but in this case the pattern holds more than not, of the chair came first and I sketched them out in wood. 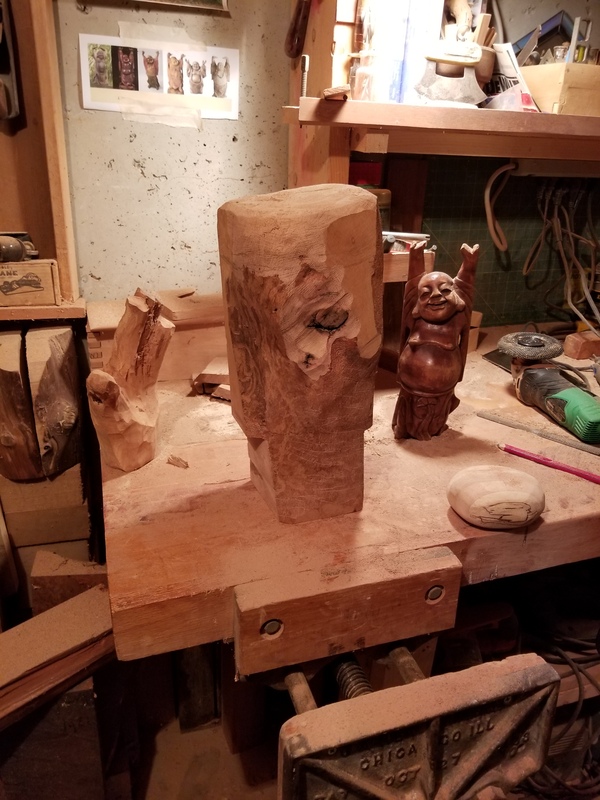 You can see a three piece back (the carve outs on the outside pieces were there in the oak cabinet but at the bottom, so here they are inverted). That piece in the center is a piece of hickory, the only not up-cycled piece in the assemblage. It was selected for the grain. We’ll come back to that. An Adirondack chair it was to be and I made some legs that I thought nicely addressed the need to be flush to the long leg base but perpendicular to the arm. No nails or screws in this baby. Is there a word for that? 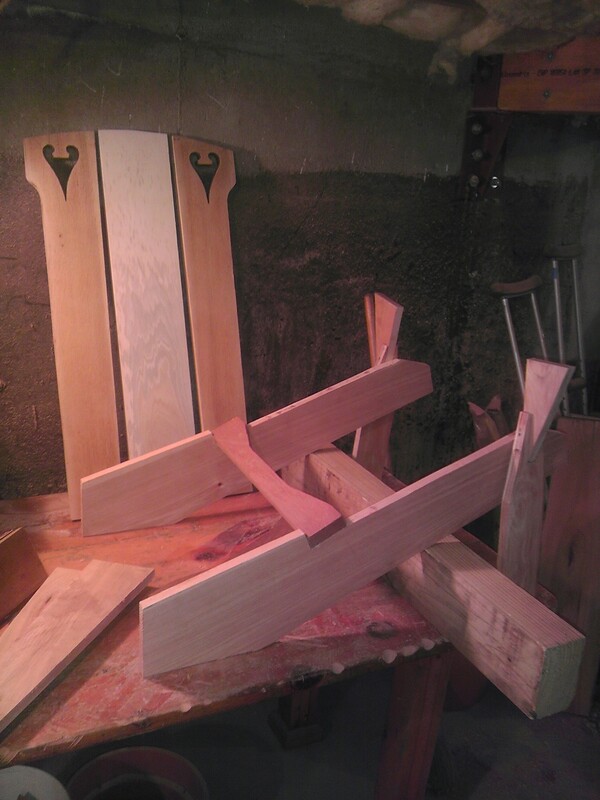 Anyway, I selected, cut out, and planed the five seat slats. Two of that cabinet oak, three random, of which one was perhaps butternut and the other two I have no idea. Suddenly though, about August 2013 the project goes fallow. I had so many irons in the fire, gourd banjos, gourd mbiras, oaken pliers, making the shop more capable, also I had a regular and sometimes intense work life too, and also I was intimidated by the joint I had selected for where the arms meet surrounding the back – I’d decided that none of the commonly used props and supports were really needed, that it would be sleeker and cooler and better – but I was not sure, so I paused. Fast forward two years. The thing sat in the shop taunting me. My nephew was going to be around for a few weeks and he’s a useful one. He helped affix the slats (and adjust them as needed), work out some of the geometry in the arm joint plan, and get the back attached. At the end of his contribution all that was really left was the attachment of the arms. Fast forward eight months. I have no idea how inertia is overcome, why things not in motion get into motion and things in motion cease to be in motion. Is there a scientific word for this opposite of inertia? 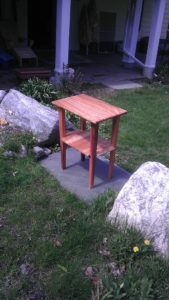 It was right after the completion of the table, which came out nicely and filled me with confidence, that I put it up next. I used a marine spar varnish, which seemed the right thing if this is to live outside. It came out strong. I used epoxy-resin on the joints where the arms join to the back piece and where the arms join to the legs. These struck me as the joints subject to the most stress and having the least mechanical advantage. 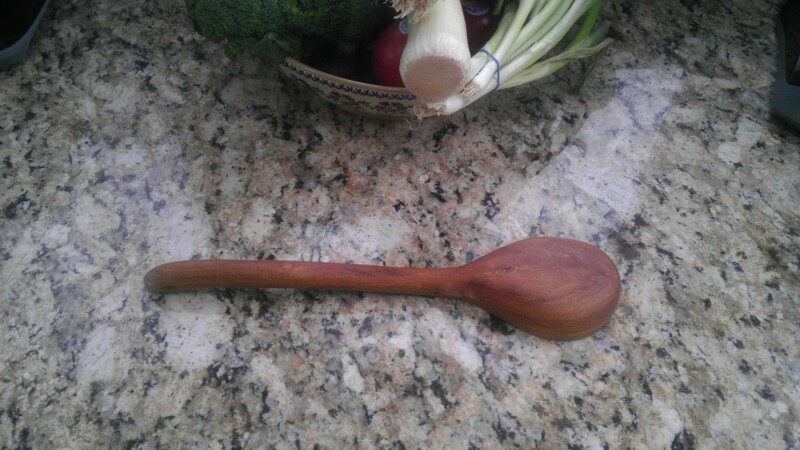 I had mentioned the grain of the hickory. Click on it to expand. to me it certainly looked like a fire with smoke. Euphemistically kundalini perhaps. Made me think of a next chair where the stone capture technique from the jade box could surround one appropriate stone slice for each chakra. <Sigh>. More ideas than time, certainly, but I’d love to get to that one and you heard it here first. I must also thank my Mother, for whom this was to be a birthday present back in 2013. She has been patient and kind in waiting. May she have many years of comfort (if, of course, it is comfortable – I sure hope so – there are so many things one does not know when one builds a first thing in a genre). I test sat in it. It was not flimsy. I felt as if I were at Campobello (translate as “some legendary place where folks who really matter contemplate the destiny of the world in the relaxed comfort of their private estates). I mean, isn’t that the feeling that a proper Adirondack chair is supposed to generate? Maybe also I felt this exaltation because of the kundalini channeling somehow made manifest in the chair – we’ll have to test it out on various subjects. It was a fun project and I’m so glad to complete it. This is the first fruit of the new jointer being set up. The joined boards were initially merely tests of having no daylight whatsoever in the joint, of having the joined boards form an honest plane, of the strength of the joint, etc. The ‘no daylight’ requirement was fully met. The ‘honest plane’ requirement, perhaps not fully. I think the combination of making sure to consistently and equally pressure the board (passing of the jointer cutting head) to the fence and the blade) as well as insuring that the fence is “””perfectly””” (can’t put that in quotes enough) at 90 degrees are the refinements to be made, as well as to be more rigorous about what compromises can be accepted. The top is two pieces of zebrawood and the bottom is three pieces of birch, set perpendicularly to the top. For each joined plane a piece of mahogany is notched into the cedar legs so that it goes across the seam of the joints it is supporting. There are a lot of little imperfections in this one (as if that’s not always true), but I did not undertake it with any purpose except that I learn something. The bonus benefit is that I had a Cable/DVD thing that resting on some milk crates inside the house. Now I can have the use of those milk crates in the wood shop and house can have an upgrade. Win-win, it seems (house and work room) with perhaps another thrown in (experience/knowledge). When some ways back I built those oak steps, I had obtained the material from a local tree guy who air dries what logs he can allocate and slice up himself on his portable sawmill. 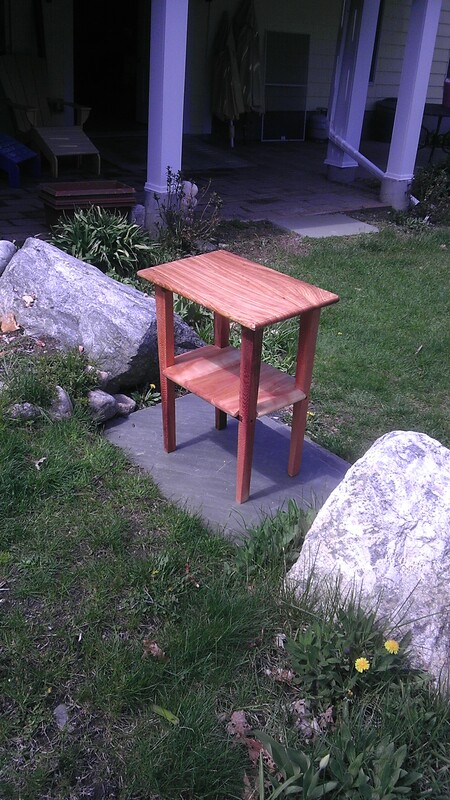 In addition to the oak I had gotten two pieces of wide beech because they were cheap and I’d not worked with beech before. 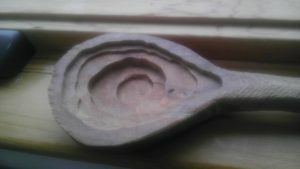 These particular pieces, I’m not sure why, after I brought them home and lay them fallow for two years, demonstrated great warping and cupping – as if perhaps they were not as dry as he thought. Next time I’ll being a moisture meter, but at the time I was not so sophisticated. I decided that I’d be a frugal miller and see if I could get any utility out of them, beyond that of firewood. The smaller piece was about six feet by 11 inches by one inch thick. I cut it in half to reduce the impact of it not being straight but rather vaguely like a bow shape and put the halves seven times (sounds biblical, the halves seven times, or Talmudic, or alchemical, or) seven times the halves were put through the thickness planer, and though this cost them almost 5/16ths of their thickness most of the cupping/arching was removed. 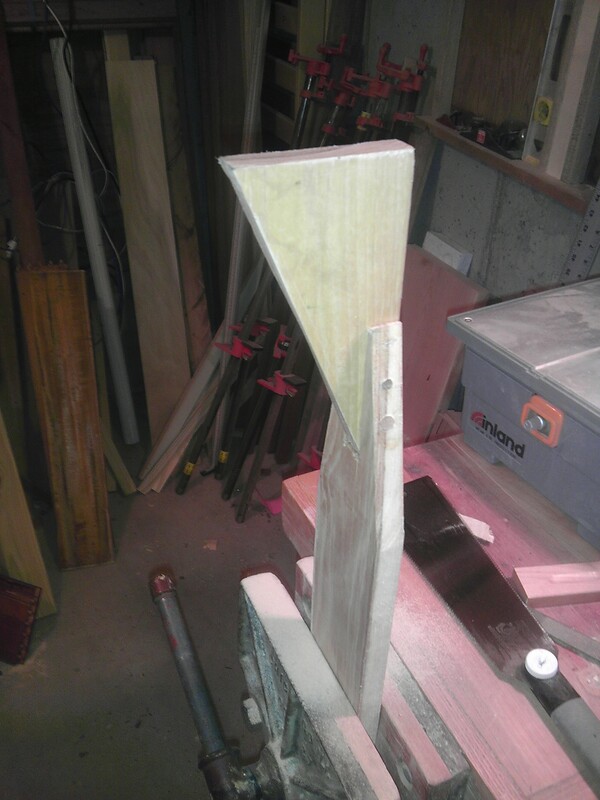 With a straight edge and tablesaw I took out the long curves and obtained the shelves you see below. It was a harder wood than I thought, had to pre-drill the holes for screws (usually I don’t use nails of screws, but for rough carpentry I make exceptions). The blond verticals are hackberry. 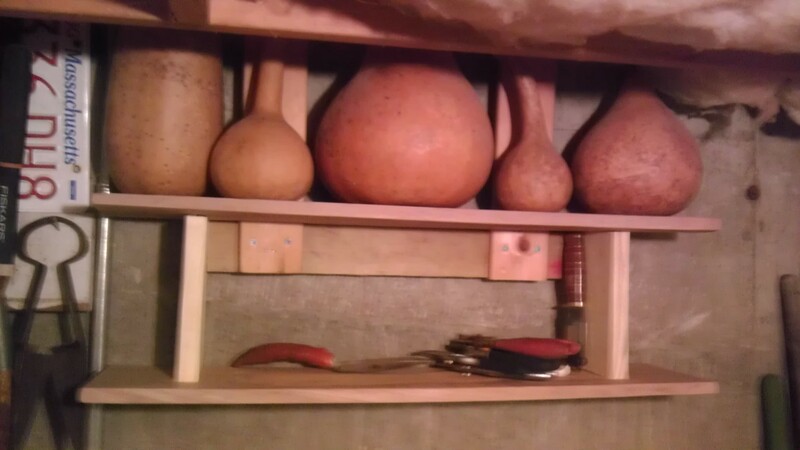 The gourds on the top shelf are very happy with the setup.